If you’re on a mission to lose weight, you’ve probably heard of these zero-calorie noodles, called Shirataki, and zero-calorie rice. At $2.50 per serving, these noodles are very expensive when compared to whole wheat pasta. One pound of conventional whole wheat pasta costs around $2 and is enough for multiple meals. But the claims of zero calories attract a lot of people to these noodles and rice made from processed konnyaku, or Japanese yam. Konnyaku is used as a gelatin substitute for vegan recipes and it has a very rubbery consistency. While in Asia this processed yam has additives to give it taste and color, zero-calorie noodles are made from the yam itself without anything added. 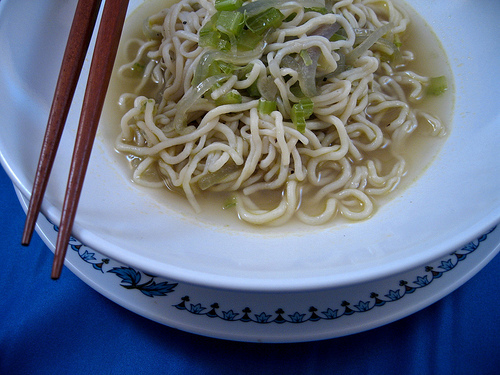 Glucomannan, or the chemical that makes up these noodles is a soluble fiber. What this means is that your body doesn’t absorb any of it but it simple passes through your body. Studies conclude that the chemical helps increase weight loss and balance cholesterol levels. The chemical is given in the United States to patients who are suffering from constipation. Reviewers describe the noodles as chewy, fishy smelling, gummy strings of pasta-like strands. They don’t absorb any taste around them and provide nothing in the way of nutrition so if you eat them with regular pasta sauce, you’re just getting sauce. Many reviewers go on to note that they just couldn’t eat them without feeling ill. So is it worth it? Probably not. Whole wheat provides flavor and needed nutrients as well as fiber that helps dieters lose more weight and lower cholesterol levels, just as the strange noodles claim to. If you’re avoiding gluten, look for traditional rice noodles or modern gluten-free varieties. It comes down to this: what’s the point of eating? If it’s to provide fuel for your body, you need calories — preferably calories from wholesome, nutritious foods and not from substances so processed that they no longer should be called food. If it’s for the pleasure of sharing a delicious meal with friends or enjoying a treat, natural foods are your best bet. Instead of looking for a miracle, focus on eating healthy foods that provide your body with nutrients it needs to function, like fruits and vegetables. It’s much more enjoyable and tasty!